Several years ago, B. Rocke Landscaping made the decision to digitize the majority of our designing, planning, and safety operations. The reason for this was twofold; streamline the flow of information throughout the company and dramatically reduce the amount of paper we were using. Our design team uses state-of-the-art software to bring your landscaping dream to life in full colour, 3-dimensional images. From conception to execution, each project exists in an online database that’s accessible to our designers, logistics, and project managers. Managers are also provided iPads for database access in the field, and files can be shared and synched in real-time. As part of our successful COR certification process, our Safety Manager, Mathew Hobson, has been instrumental in developing software and procedures to track and report all safety-related data. Everything from safety meetings to hazard assessments are recorded digitally and are accessible to our employees online. This translates into a virtually paperless environment. This is just one of the ways in which B. Rocke Landscaping is moving toward a greener future! Title photo by Suzanne DeChillo/The New York Times. Princeton, New Jersey. 05/04/04. Metro. 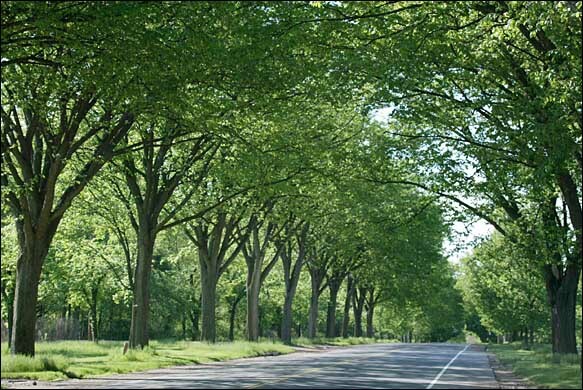 Princeton elms line Washington Road forming an stunning allee.